If you thought the 14th hole was pretty that time a rainbow settled onto the green, wait until you get up at 2 a.m., climb into a sky with more stars than you’ve ever seen, and watch a “snowbow” form over the Emmons Glacier at 12,000 feet as the ice crunches under your boots. Such are the glories of mountaineering. I grew up in Colorado Springs, Colo., with a love of the mountains. When I was 11 years old, my father, older sister and I hiked up and down Pikes Peak—all 25 miles of it—in a single day. After college, and while practicing intellectual-property law, I “peak bagged” (reached the summit of) the 54 Colorado “14ers” (mountains with elevations of 14,000 feet or more). I vacationed in the mountaineering centers of the Alps, the Spanish Pyrenees, Peru, Canada, Alaska and Mexico, and stood atop classic peaks like the Matterhorn and the Eiger (both in Switzerland) and Mount Cook (in New Zealand). I gradually became what I had imagined long ago: a real climber. I completed the transition from hiking late, but not too late. I got serious about climbing in my late 40s and became a competent mountaineer in my early 50s. I’m not alone. Every year climbers in their 50s and 60s stand atop Mount Everest. The strongest high-altitude mountaineers are often in their late 30s or early 40s. The basics. The focus here is “mountaineering”: climbing thousands of vertical feet in alpine and glaciered terrain with a guide. “Hiking,” for the most part, isn’t guided, and “rock climbing” tends to involve shorter climbs up steep rock faces (and requires explosive muscular strength, which can be difficult for people over 50, especially those new to the sport). The game is to transport your body to a higher elevation. Mathematically speaking, it’s all about “strength-to-weight ratio.” If you aren’t lean and you don’t plan on getting lean, this, again, might not be your game. You also need balance, coordination and athleticism. If you play tennis or ski or bicycle, you can probably climb. Yes, there are specific skills to learn, such as how to ascend a glacier on crampons (those spikes that attach to your boots), rappel down a rope to save the effort of climbing down, and tie knots. But your guide will help you. If you’re fit, you can climb at a high level much more quickly than you can, say, golf or ski at a high level. The limiting factor for guided climbing tends to be fitness rather than skill. Your new best friend. Speaking of guides…the purpose of the guide isn’t so much to show you the way (that’s usually apparent). It is to show you the how. Trial and error isn’t the way to learn climbing; there are no mulligans in this game. Watch out for the guides who are really guide brokers—that is, they don’t actually guide the trip but instead subcontract the job to another climber. What you need is a good climber who is also a good guide with whom you have a personal relationship. They cost several hundred dollars a day. Tip them another 10% or more. A top source is the American Mountain Guides Association (amga.com). In Europe, some countries require that guides be members of the prestigious International Federation of Mountain Guides Associations. Only a handful of elite American guides are members of both. Study instruction books. The climbing bible is “Freedom of the Hills,” now in its 50th anniversary edition. It consists of nearly 600 pages on everything from how to tie into a rope (securely) to how to climb vertical ice (carefully). Gear. Buy your own pack, boots, ice axe, gloves, crampons and helmet, because fit is important for those things. But consider renting other equipment or allowing your guide to supply it, at least initially. For alpine mountaineering (as opposed to rock climbing) you don’t need as much as you think. You already own most of the necessary clothing. Don’t buy boots online. For $1,000, plus rentals, you’ll have all of the equipment you need for serious alpine mountaineering. No camping required. You can climb without camping. You get an “alpine start” at 3 a.m. to beat the afternoon thunderstorms, you summit before noon, and you’re rehydrating at the local pub by late afternoon. Many of the climbs that are multiday are “hutted,” especially the thousands of fabulous climbs in the Alps. These huts are often staffed by cooks who prepare a hearty and occasionally tasty dinner for the cost of a restaurant dinner. If you can get out of the stinky, noisy community bunks and into a stinky, quiet private room, it’s worth the extra fee. Go with the flow. Amazing things can happen, and standing on top is often the least of them. Years ago on summit day on Mount Kilimanjaro in Tanzania with my 11- and 13-year-old daughters, the older child developed altitude sickness, a potentially serious condition. We aborted our summit attempt and carried her on our backs from 17,000 feet to the base of the mountain in a single day. A head start. Be honest and realistic with yourself about your goals and limitations. 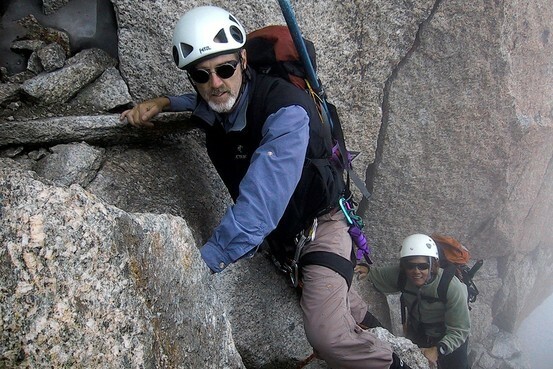 As a middle-aged climber your “first ascents” will be of the metaphorical kind—they will be of the mountain within you. But that’s good. Young climbers waste a lot of time on the literal kind before they get around to the metaphorical kind. You’ll be way ahead of them. And they’ll have nothing on you in adventuring. Like them, you will sometimes get cold, tired and a little scared. If, like them, you’re still glad you’re there, then this might be your game after all. Mr. Beaton is a writer in Aspen, Colo. He can be reached at encore@wsj.com.